The best waterproof notebooks will enable you to jot down ideas and thoughts anytime, anywhere, no matter the conditions. You can write on their pages in the shower or bath, outdoors in the rain, snow, ocean, and even in inclement weather. And there’s no fear that your notes will be ruined by wetness. 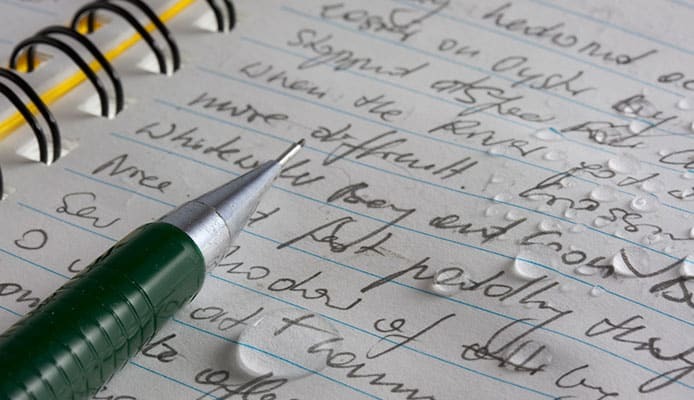 Your writing will survive water, sweat, tears, coffee spills, the washing machine, and more to stay clear and legible. Whether you want to keep an outdoor adventure log, note down the ideas that come to you in the shower before they go down the drain, take notes in the field or lab, or need a writing pad to carry anywhere, you need such a hardy weatherproof notebook you can count on. Following is our top five picks of the best waterproof notepads. If you ever need to note down something while underwater, these Field Notes Expedition notebooks are up to the task. They are truly waterproof and rainproof notebooks. They have been tested to be waterproof and windproof. You can even have fun testing them in your sink. The Yupo synthetic paper and the covers are plastic-like. Water beads and slides right off instead of getting absorbed. Designed for the adventurer, their durability and portability are excellent. They are tearproof and their waterproof notebook reviews by users attest that they indeed stand the tests of bad weather, outdoor elements, heavy pocket use, and time. The small and lightweight size fits in a hiking pant or jacket pocket easily and these notebooks are the perfect companions wherever you go. Each notebook has 3.5 X 5.5 memo pads with 48 dot-grid pages. This size is ideal for small lists and notes. Just make sure you use the right pen to avoid smearing. 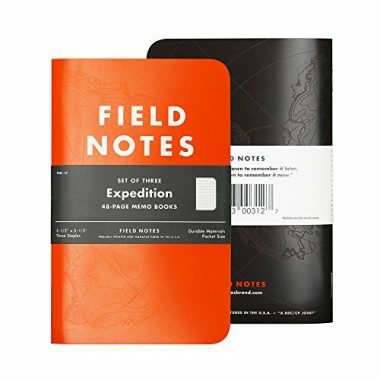 The hardy Expedition waterproof field notebooks are the best waterproof notebooks for outdoor adventures such as hiking and backpacking anywhere and in any condition. 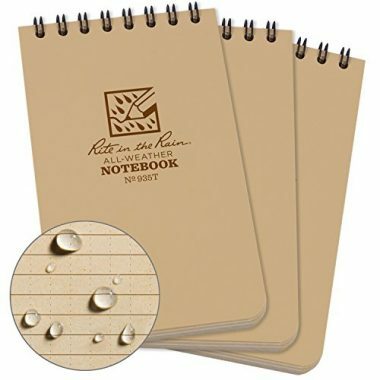 When it comes to weatherproof notebooks, Rite in The Rain is the leader. They've been in the business since 1916. These Tactical Notebooks are the most durable notebooks around. They are tough enough to survive rain, sweat, mud, snow, oil, grease, and even the washing machine. The all-weather paper is strong and can be used in the rain, in inclement weather and even while wading in rivers with no problem. Just use a pencil or an all-weather pen. Ballpoint pens work just fine when the papers are dry. Water-based inks are a no-no. The Wire-O binding is tough and impact-resistant. It keeps its shape despite constant shoving into pockets. The Polydura cover is flexible but tough, protecting the notebook from scratches and stains. The cover also features useful measurement information. The 3" x 5" top-spiral notebooks are convenient to carry and ideal for quick notes. Each notebook has 100 pages. They are earth-friendly, as they are recyclable. These top rated waterproof notepads are great for EDC and the right tools for the job for those who work outside. With a variety of color options, you can pick your favorite. A pack of five all-weather top spiral notebooks for less than ten dollars is an incredible deal. If you fill up notebooks very quickly, you will find this Aketek package appealing. The 5“x3" fits nicely in pockets. Each notebook has 50 tear-out pages. The pages are paper with a water repellent coating. They are not 100% waterproof, but they withstand showers, splashes, sweat, spills, light rain, high humidity, and short-lived submersion in water - for example, if accidentally dropped in a puddle - and come out legible and useful. Ballpoint pens and pencils work fine on these pages. The plastic covers protect the pages from the elements and wear and tear. 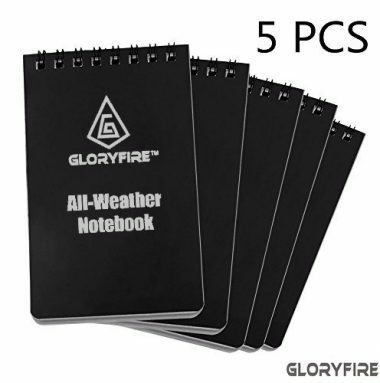 Another pack of five all-weather notebooks for less than ten dollars, this is another incredible bargain, this time by GLORYFIRE. The paper is water repellent and causes water and other liquids to slide off instead of penetrating and smudging the writing. Pencils, ballpoint pens and permanent ink markers all write easily on these grid pages. You can tear out papers easily. 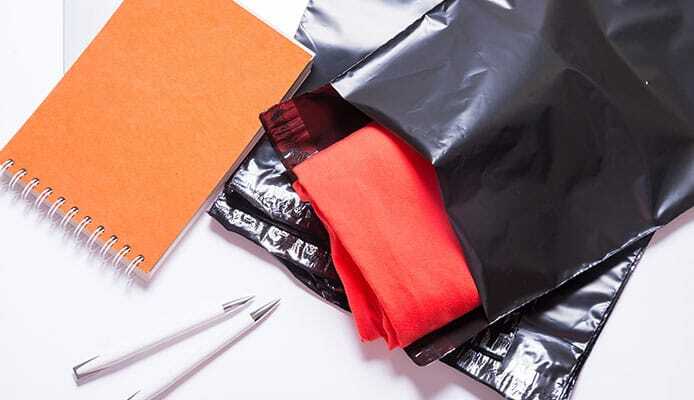 PVC material makes for a tough, protective cover while the wire loop binding stays intact. All these make for a notebook that holds up well. These notebooks are even secured by a two-year guarantee. The handy size and durable construction make them ideal for hikers, backpackers, sportsmen, tradesmen, etc. Each mini memo pad has 48sheets/98pages. The 3" x 5" size is pocket convenient and won't take much space in a jack pocket or a travel or hiking backpack. 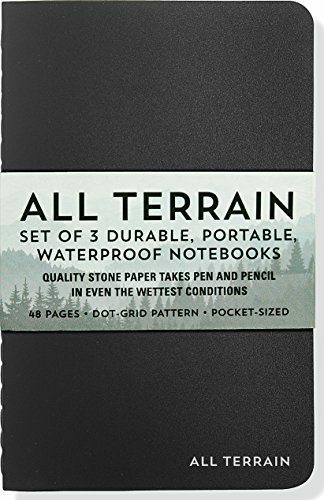 These all-terrain notebooks aren't bothered by rain and other paper enemies. The stone paper pages are smooth and hold writing very well. Pencil works best with this paper in wet conditions. The dot-grid pattern on the pages offers flexibility of use. The covers are strong and won't tear or buckle. The bindings are sewed to ensure durability. Each notebook has 48 pages and measures 3-1/2 inches wide by 5-1/2 inches high. The perfect thickness and size to fit in pockets whether jacket pockets or hiking daypacks pockets. Your intended use will determine the best waterproof notepad for you. As you shop, keep in mind where and how you will be using it so you can make the right choice. For example, if you want a notebook to use while exploring the underwater world, you will need to ensure you choose one that you can write on underwater. If you want to document your journey to the summit of a certain mountain, you will need a notepad that is not only rainproof but can also withstand and work in extreme cold and snow. 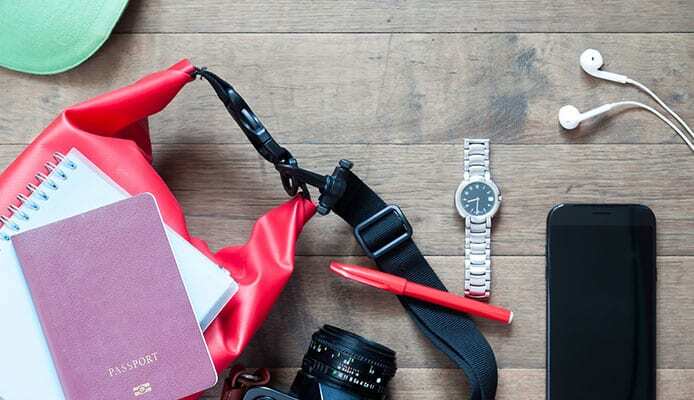 When shopping for a waterproof notebook, you’re looking for a reliable notebook you can take with you anywhere and that can stand up to all kinds of weather elements and abuse. For the best performance, you need a quality product that does what it’s meant to do well. The best waterproof notebook for outdoor use should be rugged enough to handle any element mother nature might present. It should hold up well to being rained on, snowed on, dropped in pools of water, spilled on, thrown in the laundry by mistake etc. It should also stand up to the constant in and out of the pocket handling. The papers should be all-weather in order to work in any condition. The pages should be easy to write on in the rain, snow, sleet, frigid temperatures, high humidity, using sweaty hands etc and the writing should be clear and legible. Upon coming into contact with water, the pages shouldn’t stick together, turn into mush or tear easily. The binding should be robust. The covers should be tough enough to protect the pages from moisture, scratches, and stains. Check waterproof notebook reviews by users to find out whether a notebook is water resistant vs. waterproof, works and holds up as well as it claims. Top rated waterproof notepads, such as the ones in our waterproof notebook reviews, will be high-quality and durable. Waterproof notebooks come in all sorts of sizes so you can find the ideal size for your needs. Want an EDC notebook to have with you all the time to capture ideas and thoughts before they disappear? A compact and lightweight pocket-size is the convenient size. It will fit in your pant, shirt, or coat pockets or the exterior pocket of your backpacking backpack or bag. These waterproof pocket notebooks are ideal for small lists and quick notes. If you need a larger size for taking a lot of notes such as when working or studying in the field, there are bigger sizes too. Consider the number of pages/sheets the notebook has too, to ensure they suit your needs. Other than the classic pocket notebook, there are other types of waterproof notepads that might be the ideal choice for you. There are field notebooks, hard-bound books, flip-up notepads, loose leaf paper, and more. Upon opening the notebooks, you will come across ruled, graph to plain papers. No matter what you need it for, there is a type of waterproof notebook designed just for the purpose you want it for. Q: Why Use Waterproof Notebook? A: If you’ve ever tried to write on wet ordinary paper or in a humid/wet environment, you know its impossible to make a mark. And when regular paper comes into contact with water, the pages stick together, the ink smudges and the writing is ruined, and the papers become so soft that they tear easily. These two challenges are the reason why to use waterproof notebooks, whose paper can be written on in wet conditions. When exposed to moisture, pages in a waterproof notepad stay in good condition. And the writing stays clear and legible. If you need a reliable notebook to have with you always, write on anywhere and have confidence that your notes will stay intact, a waterproof notebook is it. Q: When To Use Waterproof Notebook? A: Whenever you need to take notes in wet or less than ideal conditions. They are great EDC notebooks to be taken anywhere and used anytime. It could be in the shower, in the lab, or outdoors. 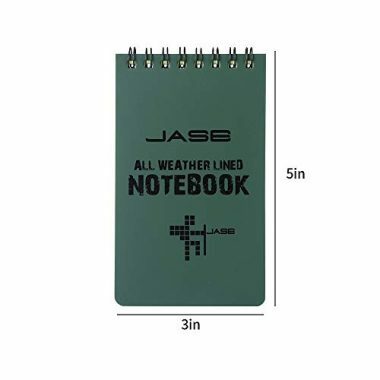 Whenever you need a notebook that can withstand all kinds of weather elements and abuse. Need to carry a notebook to document your adventures and note down ideas that come to you when you’re relaxed? You need the best waterproof notepad. These notepads should be in every fishing trip checklist and they make great gifts for backpacking, hiking, and camping enthusiasts. They are also the right tools for those who study or work outside in the military, construction, journalism, fisheries and more, and need to take notes. Q: How Water Resistant Is Waterproof Notebook? A: Some waterproof notebooks are truly waterproof and can even withstand submersion, which means that you can use them to jot ideas underwater. Some weatherproof notebooks are just water resistant/repellent and only able to withstand showers or light rain and not a heavy downpour, prolonged exposure to moisture, or submersion. We believe that a notebook is an essential accessory to have on hand no matter where you are. You never know when a brilliant idea might strike or when you might need to note down something. Smartphone apps are great. There’s no disputing that. But they can never beat the old-fashioned paper notebook. Writing on paper, you are better able to reflect on and commit to memory the ideas and thoughts. But a notebook isn’t going to serve you well if it is impossible to write on in less than ideal conditions or the notes get ruined when it gets wet. By investing in the best waterproof notebook, you will have a reliable and hardy writing pad you can take anywhere and that can stand up to all kinds of weather conditions and abuse. Just be sure you use the right pen. A pencil, permanent marker, an all-weather or underwater pen work fine. Ballpoint pens will also work as long as the paper is dry. Water-based inks are a no-go. With this combination of waterproof pen and paper, you’re equipped to jot notes no matter the conditions and have peace of mind they will stay legible. How about you? Which weatherproof notebook is your personal favorite, even if it isn’t included in our waterproof notebook reviews? Let us know your thoughts and experiences in the comment box below!